The official Bruce Springsteen calendar for 2017, now 2/3 off! 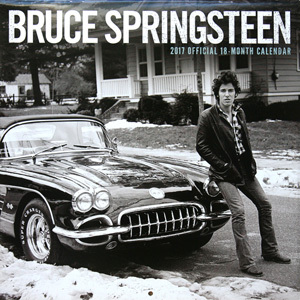 This official 2017 Springsteen calendar from Thrill Hill Productions coincides with several other big releases this fall, sharing Frank Stefanko's 'Corvette Winter' cover image with the Born to Run bio and Chapter and Verse. Accordingly, the monthly shots inside span Springsteen's career, from January's kid on the streets of Long Branch to December's latter day E Street Band. Each month of 2017 features a large image (12" x 12"), with photography by Stefanko, David Gahr, Joel Bernstein, Pam Springsteen, Jo Lopez, Anton Corbijn, and Danny Clinch (see the back of the calendar below for a look at each month). 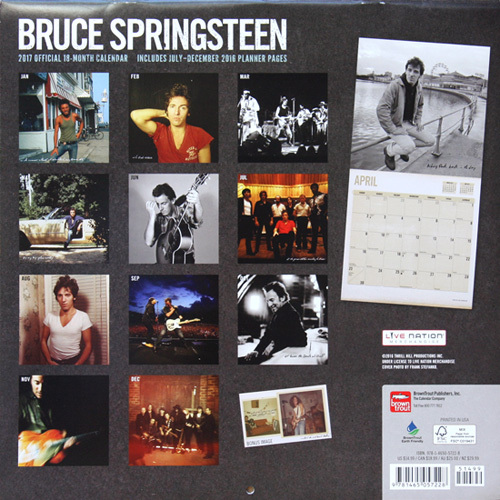 Like previous Thrill Hill calendars, this Bruce-licensed 2017 model is high quality on glossy stock and very useful, with space to write for each date and major holidays marked. 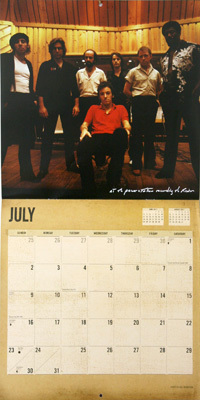 An 18-month calendar, it can be used immediately as it starts with July - December 2016 on the opening spread.